Cameron K. Lindsay’s new book “Triple Deuces: A Day in the Life of an American Correctional Worker” is an inside look at the inner workings of U.S. prisons and jails. Recent release “Triple Deuces: A Day in the Life of an American Correctional Worker” from Page Publishing author Cameron K. Lindsay is a behind-the-scenes perspective on the daily lives of inmates and officers in US prisons, an engrossing and informative history on various American correctional facilities and lessons learned from significant outbreaks of inmate violence. Cameron K. Lindsay, a former police officer, police dispatcher, criminal justice college instructor, and career corrections worker and prison warden who resides in his native Morgantown, West Virginia, has completed his book “Triple Deuces: A Day in the Life of an American Correctional Worker”: an eye-opening perspective on what goes on inside prison walls. “Triple Deuces” goes deep inside the fences and walls of jails and prisons to provide the reader with an unvarnished reality of how and why things happen inside of America’s correctional facilities. The author provides the reader with raw and vivid accounts of his personal experiences, while interweaving similar experiences that have occurred in other jails and prisons. 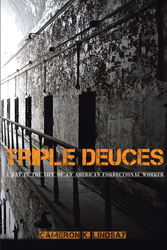 “Triple Deuces” is exciting and entertaining, but educational, and even humorous at times, as the author explains the dynamic nuances of our correctional facilities. Published by New York City-based Page Publishing, Cameron K. Lindsay’s book is a fascinating and sobering reflection on a nearly three-decade career in the American correctional system. Readers who wish to experience this engrossing work can purchase“Triple Deuces: A Day in the Life of an American Correctional Worker” at bookstores everywhere, or online at the Apple iTunes store, Amazon, Google Play, or Barnes and Noble.